The par-71, 6,374-yard Championship Course at Viewpoint opened in 1996 and features generous tree-lined traditional fairways, immaculate greens and panoramic mountain views. With more than 40 bunkers and lots of water hazards, strategic course management is a must. We offer four sets of tees to accommodate players of all ability levels. You’ll know we love golf AND tennis when you see our pro shop stocked with hundreds of personal gifts and decorative items all in the "Name of Tennis and Golf". You'll find wall plaques with clever sayings, desk accessories and lamps trimmed with nostalgic miniature balls and clubs. Or what about cookie jars that look like stacks of golf balls, bookends with golf themes, hors d’oeuvres platters, barbecue aprons and oven mitts – all for the golf enthusiast! Whether you're an avid golf fanatic (or you're only shopping for one) you’ll enjoy browsing through our collection. In addition, we carry full lines of clubs, equipment, accessories, and fashionable men’s and women’s golf apparel. Our featured brands include: Adidas, Footjoy, En Fuego, SportHaley, Bette & Court, and Fairway Outfitters. We are authorized custom club fitters for PING and Tour Edge, featuring the latest in golf club technology. 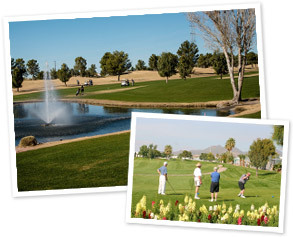 Call our pro shop at 480-373-5555 or 800-822-4404 for more information. Residents of ViewPoint receive 20% off all non-sale merchandise! Things are always on sale for you!